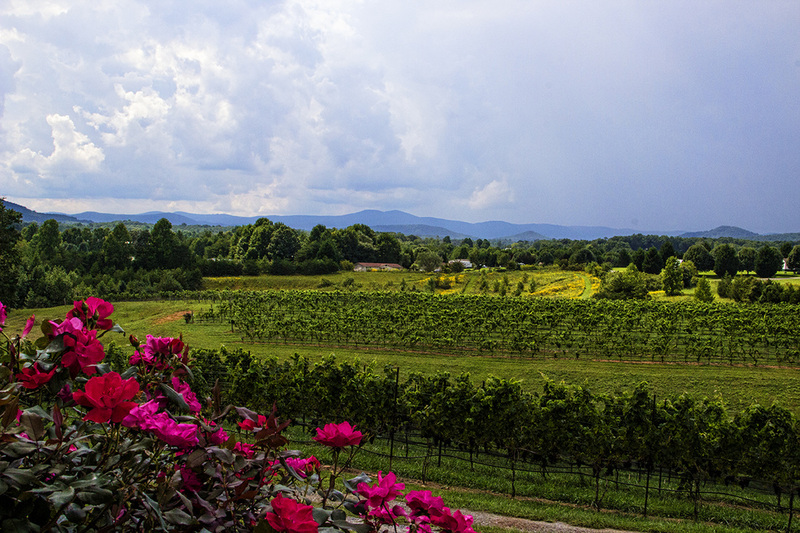 The Blue Ridge Mountains provides the backdrop for Round Peak Vineyards, 13 acres which produce French and Italian varietals. I hear words like viticulture and enology. I confess, before my visit to North Carolina's Yadkin Valley, I had no clue. I consulted Websters for clarity. Come to find out, I had experienced these two concepts long before my summer's visit to these Appalachian Mountains sitting at the foothills of the mystic Blue Ridge Mountains. Folks, you are in wine country and you'll not be able to drive ten miles without being reminded of this fact: you're in one of the United States' most fertile regions for thriving vineyards and wine making, and the vintners have an elixir poured and ready to prove it. 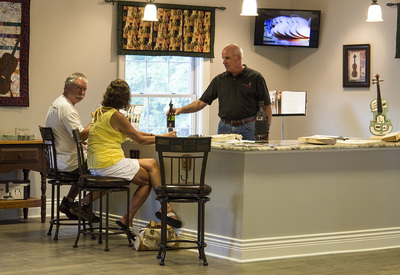 In the Yadkin Valley, there are more than 40 wineries, and there are 17 in Surry County alone. 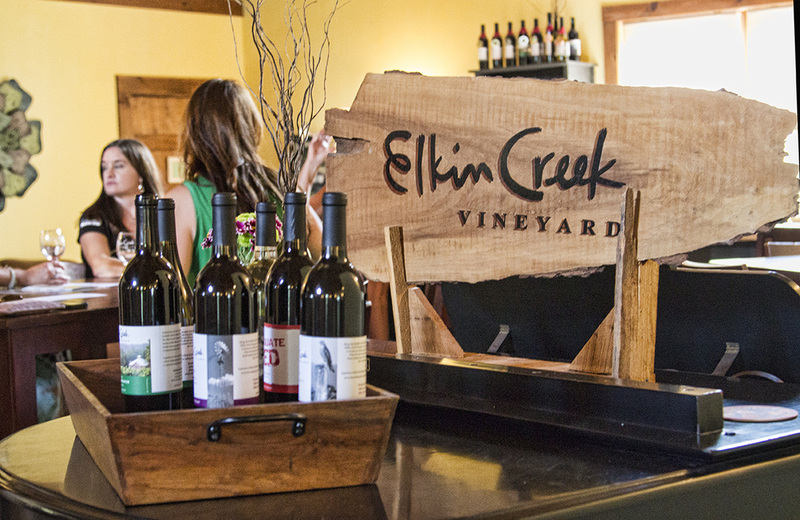 "The Yadkin Valley is very much like Old World Europe," says Louis Jeroslow, winemaker at Elkin Creek Vineyards. "It's like stepping into France and Spain and Italy right here in the foothills of North Carolina." All together, North Carolina promotes 26 wine trails, stretching from its coast to its mountains - that's more than 400 vineyards and 100 wineries across the state. With similar elevations to Napa, the land is engraved with French, American and Italian varietals and, surprisingly, wine makers who are excited to share their story, their process and their final tour-de-force. The brand, JOLO, combines JO (Joey) and LO (Logan) and honors the Ray's sons. Sparkling wine at SCC. The wine ferments in the bottle and students make partial turns each week. 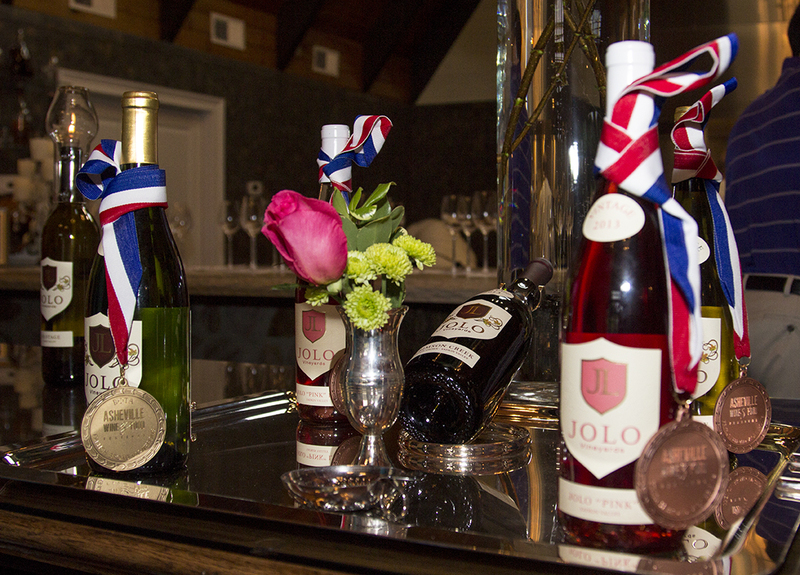 JOLO opened with a vision of being a boutique winery that would also include a fine dining experience. End Posts is open Thursday through Sunday. Elkin Creek has 5 acres of grapes - "a petite vineyard" - and averages 750 cases per year. Adagio produces four wines, three white and one red. Shelton Vineyards in Dobson believe that fine wine begins in the vineyard. Round Creek Vineyards focus on relaxation. During September, it's the Skull Camp Out where over 150 campers descend on the grounds for the weekend and push relaxation to its limits. In the viticulture and enology program, there is a capacity for 30 students. "There are more people who want to make this a career," says Geller. "This is a full blown industry now." 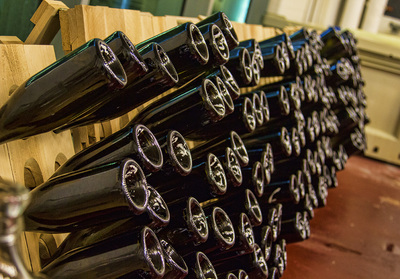 With over 130 acres in grapes, Shelton Vineyards can produce over 2000 cases per day. Every wine maker is eager to reveal his beginning. Whether it evolved from years of experience or years of dreaming, each is a story constructed with passion. 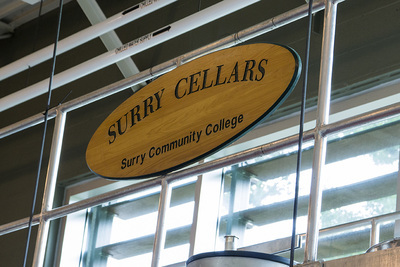 For many, the beginning is Surry Community College (SCC) in Dobson. As the only licensed, bonded winery in the Southeast as part of a college educational program and the only one on the East Coast, it's a resource that is immeasurable to novices and experts. In programs where students complete the entire process, the college offers a degree, diploma and certificate in Viticulture (the study of growing grapes) and Enology (the study of wine making) Technology. It's definitely not your average college campus with 8-acres (adding two more next year) of teaching vineyards with a state-of-the-art winery and a 25,000 gallon capacity. Bottled under the label Surry Cellars, students have won 17 medals in the past five months with eight being from international competitions. They even offer classes (non-credit) on how to make wine at home. 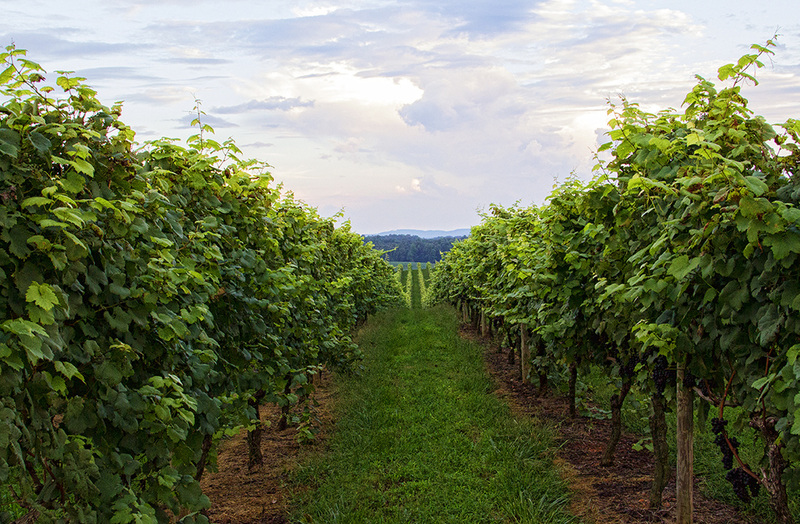 Joseph Geller, lead enologist, explains how North Carolina has come full circle. "Back in the 1700's," he says, "it was grapes. Then, it was tobacco and soybeans and now grapes again. We're back!" The college helps local farmers who once grew soy beans and now grow grapes. The climate, the soil - everything works perfectly together with the exception of one challenge: the humidity. 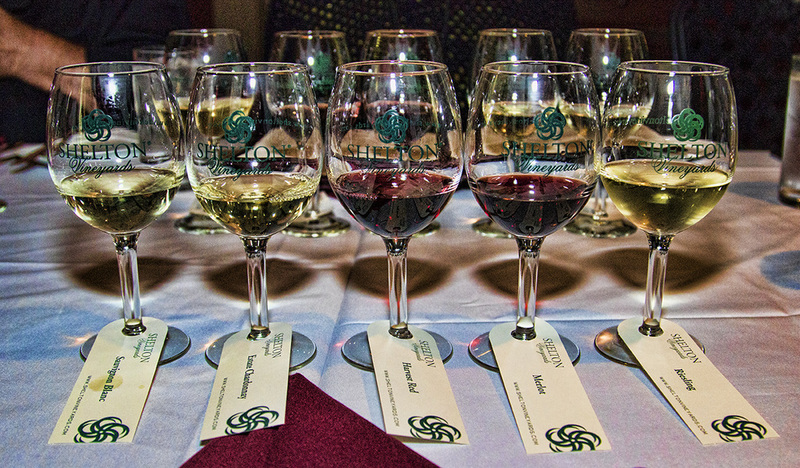 But as SCC will tell you, as well as every other vineyard in the area, that 2014 was an excellent year. It has been the "best climate" they have seen in years, and the 2014 vintage is extraordinary. For young wine makers like JW and Kristen Ray of JOLO Winery and Vineyards, Surry Community College became an immediate resource. In 2010, the Rays discovered the rolling hills of the Yadkin Valley and the inviting acreage nestled in the shadow of Pilot Mountain and said good-bye to Fort Lauderdale life and hello to their life-long dream of becoming winemakers. As they cleared the land for the winery, they preserved remnants of four massive trees; the tasting bar now rests upon the land's legacy. The first vintage (app. 700 cases) was in the fall of 2013 for this eco-friendly vineyard; in 2014, they plan for 1200 cases, reaching their maximum output in 2015 of 2000 cases for their 10-acres of vines. Fifty percent of their products comes from their grapes while the remainder comes from other Yadkin Valley vineyards. "Our goal is to serve the highest quality wine versus trying to force something to grow here that doesn't grow well," says JW Ray. "We will focus in and be craftsmen and artisans." 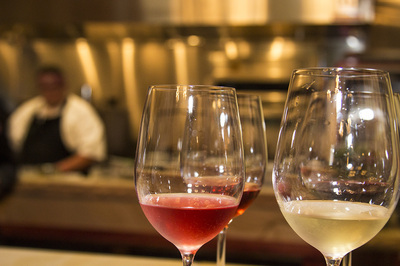 To complement the wine experience, their 24-seat restaurant End Posts provides a two-three hour dining experience (A La Carte menu or prix fixe) complete with white glove service and Chef Brian Brown, a classically trained Napa chef serving farm-to-table creations. It wasn't Ray that chose Chef Brown; it was his guests which, to most, seemed like a very unorthodox way of decision-making but one that was spot on. Ray gathered a group of chefs and charged them in front of his guests. "Serve me your best," he said. They did, and by the end of the night, it was Chef Brown's personality and food that received a unanimous vote. Since opening night, the restaurant has been sold out. At Round Peak Vineyards, its difficult to make a decision as to which is most satisfying: the view or the wine. Luckily, you can have both. Ken Gulaian, owner of Round Peak Vineyards / Skull Camp Wines in Mount Airy, was drawn to the region because of its climate. Since his background in wine making was limited, he also reached out to SCC. "We're at about 1,300 feet in elevation," he says. "The higher you are, the cooler the evenings tend to be. Because we're in the foothills of the mountains we get a better breeze than a lot of other areas. It's debatable, but we think we get a bit less rain than other places in North Carolina. All of that lends itself to supporting the French and Italian grapes we grow." They are one of two wineries in the state that grows Nebbiolo grapes which produces a robust, dark medium-bodied wine. "It's very unique to the region and fairly unique within the United States." The Valley's newest winery is Adagio, named for its owner's classical passion, the violin. To perform slowly, with passion - describes Dr. Jan and Dr. Timothy Wahl's methodical sentiment of wine making as well as their hand-crafted violins. Still practicing dentists, they combine "violin making, winemaking, beautiful music and wonderful wines, all in the same place," explains Tim. "This is the dream." Adagio's location was chosen because it's in the "heart of the North Carolina wine country, with excellent growing conditions." When Jennifer and Nick White married beside the waters of Elkin Creek in 2008, they had no clue that one day it would be home. They liked it so much, they even said to the owners jokingly, "if you ever consider selling . . . " Three years later, they said good-bye to their theatrical triumphs of Blue Man Group in Las Vegas, and along with the Jeroslows who also worked the show purchased Elkin Creek Vineyard in 2011. "We like people to come here and experience the wine," says Jennifer White. Not only is the winery a draw, but their Sunday made-to-order brick oven pizzas brings the community to Elkin Creek. The stream provides the perfect backdrop for weddings and with the addition of four cabins, it is the perfect hideaway among the vines. Then, there are Charlie and Ed Shelton, two brothers who came home to Surry about 15 years ago. In an effort to boost the area's economy, they decided it would be grapes. "We wanted to so something to help this area because there had been a lot of job losses," Ed Shelton says. They opened one of the valley's flagship wineries, Shelton Vineyards, in 1999, and spearheaded the push to get a federal AVA (American Viticultural Area) designation. Along with geographical boundaries, there must be evidence that climate, soil, elevation and physical features are distinctive. The valley was awarded this designation in 2003. As the largest family owned winery in North Carolina, Shelton Vineyards has over 130 acres of grapes, and all wines are made from their grapes, designating them as an estate winery (wines must be 100% of own grapes). They have nine varieties of grapes, six red and three white. They say they have a better response with red, but one would never know. They, like many others, have discovered that good food makes great wine even better. At the Harvest Grill, Chef Paul Lange confirms that his "crab cakes have a huge following." Acknowledged as one of "100 Foods to Eat in North Carolina" by Our State Magazine, these crispy cornbread crab cakes confirm Chef Paul's description of the Grill's food - "we're high-end comfort food with a twist. We're not trying to reinvent the wheel; we're not here to push limits." In downtown Elkin, Jason Wiseman is making wine at Brushy Mountain Winery. There's not a vineyard in sight, only Main Street right out his front door. "I love being an urban winemaker," he says. "I can do everything here and I don't have to mow the grass." His love of wine led him to Napa where he did an internship for a couple of years. He returned to the Yadkin Valley, went through classes at SCC, and followed in the tradition of becoming a small, boutique winemaker. "This is a spirit of cooperation," he says referring to the myriad of wineries and vineyards that are located just steps from his front door. "People don't come here for just one winery. We offer an education across different vintages. This is the land of sweet tea and Coca-cola. We don't live in a wine culture, but we're seeing it develop. People want to learn and we tailor tastings to be fun and informative." 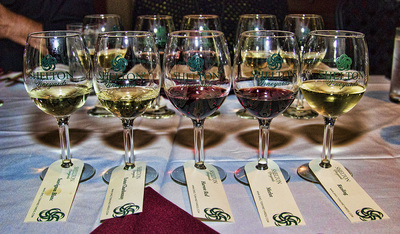 For more information on all North Carolina winery tours, visit visitnc.com/wine, ncwine.org or visitncwinecountry.com. Then, return, and tell us about your discoveries! Cheers! 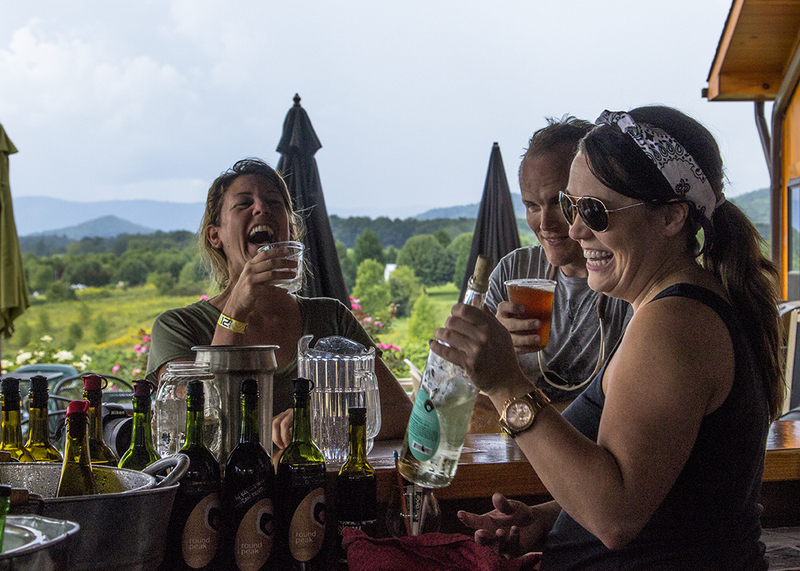 After about the third vineyard in your tour of North Carolina vineyards and wineries, you begin to wonder which is more incredible, the views or the wines. At Round Peak, the outside tasting area invites friends as well as their four-legged friends to experience the serenity of the mountains. Once a year, Round Peak invites campers to set-up on the hills beside the winery, spend the weekend, and enjoy new wines and new friends.